Can an Instant Pot be used for more than just soups and stews? You bet it can! And desserts are a great way to utilize this fun new kitchen gadget. Cakes cooked in a pressure cooker stay unbelievably moist and delicious. And the Instant Pot even has a specific setting for cake. They were made for each other! Grease a 7-inch (18 cm) ceramic pan well — a soufflé pan works great. Place the trivet in the bottom of the Instant Pot and add one cup of water (not included in ingredients). In a large bowl, whisk together the flour, sweetener, baking powder, cinnamon, ginger, cloves, and salt. Stir in the eggs, melted butter, water, and vanilla extract until well combined. Spread the batter in the prepared baking pan and smooth the top. Sprinkle with chopped nuts. Cover the pan tightly with aluminium foil. Set on top of the trivet in the Instant Pot. Close the lid and choose the cake setting. It will automatically set for 40 minutes. Once the cycle is finished, allow the Instant Pot to naturally release the pressure for 15 minutes. Then remove the lid and lift out the ceramic dish. Cool completely in the pan. Remove the foil and transfer the cake to a serving platter. Serve alone or with lightly sweetened whipped cream. 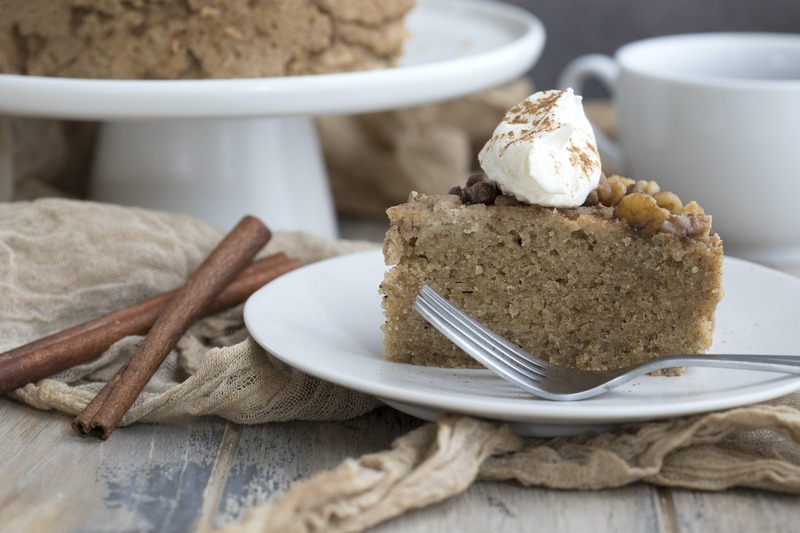 This easy spice cake is almond flour based cake with plenty of warm fall spices like cinnamon, ginger, and cloves. It can be made with butter or a non-dairy oil like coconut. I topped mine with some chopped pecans and walnuts, and when it was finished, I served it with some lightly sweetened whipped cream. Simple and delicious, no need for sweet frosting or glaze. To cook a cake in a pressure cooker, you need a pan that fits inside and sits on the trivet, so you can fill the bottom of the cooker with water. A 7-inch pan fits inside most standard Instant Pots. A springform cheesecake pan works well but you have to make sure to wrap the bottom in foil so that the water doesn’t seep in through the seam. For a cake like this, I recommend using a 7-inch ceramic soufflé pan. If you grease the pan properly, you can even flip this cake out onto a serving plate after it has cooled. Simply cover the top with a large plate and invert it. Then flip it back over onto your serving plate. This sounds delish -- how about time & temp for oven baking instead, please? The ingredients and amounts of each for this recipe were specifically formulated for a pressure cooker. They may not work as well when baked in the oven. My Instant Pot Duo (the most popular model) does not have a cake setting. What setting should I use? This recipe was a hit with my family. I don’t have a cake setting but just set to pressure cook for the time listed in the recipe. If you do not have an instapot can you still make this recipe? I do not own one and are not interested in getting one. My family used to make something called a Welsh Boil Cake that was made in a Dutch Oven. It sounds a little like that same process. This has not been tested for oven/dutch oven baking at this time. I looked around online and it appears that the cake setting is simply normal high-pressure set to 40 minutes. It’s just a pre-programmed button that does the same thing. Lacking an Instant Pot I will have to play around with my Tefal 8in1 and its cake setting. I might have to eat some almond pudding until I get it right. Oh, and when you get it right, will you share the recipe? I bake it in the oven for about 20 min at 350 and it was amazingly delicious. A real treat hard to resist and satisfying. Made this tonight and it was amazing. Even my non Keto daughter liked it. I used crushed pecans on top. It cooked and flipped out nicely from a Pyrex bowl (roughly 7 inch). I couldn’t even wait for it to be completely cooled! I have an Insta Pot Duo and used Steam, Normal, High Pressure for 40 minutes and followed remainder of directions. Thank you for a great winter warm dessert! has anyone tried it in a metal pan instead of ceramic? I have a 7 inch spring form pan but no 7 inch ceramic baking dish. I have tested this recipe in the oven. Because of the liquidness of the mixture I separated it to an 8 square compartment baking tin and baked at 150 degrees C at the top of my oven for about 25 minutes. It came out great and a perfect mini cake to put in my lunch box. If you are going to make a single large cake it should still work but I would recommend baking in the bottom of the oven as it will need to be in there longer and you don't want the outside to burn. I just now made one in my springform pan, but follow the directions to cover the bottom of the pan in foil (I wrapped it up to the rim) to keep moisture out. It is THE most moist cake I have ever tasted! Delicious! How many net carbs does this work out to just for the cake without whip? This cake was amazing. I baked it because I don’t have a pressure cooker and it came out delicious. Such a good cake. I made this in a glass bowl in the InstantPot on Cake setting. I made two variations; one in a smaller bowl, one in a bigger one. The bigger cake had to go back in the oven for about 10 minutes on 350 F and I should have put the smaller one in as well because it was a little undercooked. I flipped them upside down out of the glass and onto a baking dish to garnish. Very pretty and a really good cake! We have not tested this in smaller dishes. It may take less time to cook. I just tried made this and am letting it cool! The cake is pretty moist, almost pudding like. I added more than a cup of water to the instant pot. Perhaps that why? Anyway, I cooked it a bit longer and seems 👌!! Wondering if this might be a good base cake to convert into carrot cake (by adding coconut flakes, shredded carrot, walnuts, and a little crushed pineapple. You would probably have better luck using this recipe. I made this recipe in my InstantPot, and loved it! It has now become a family favorite. I have a Lux model and a Nova Plus model and both work well. I found that 50 minutes on the manual or pressure cook setting worked best. I purchased a 7 inch ceramic soufflé pan from Amazon, which worked wonderfully. It’s good for dessert and breakfast too! Thank you for developing and posting this great recipe. Yum!